Printed Inside Pockets and Spines (PIPS) is our term for printing on the reverse side of the stock to give complete ink coverage. Use it to ensure that continuous images that cross the spines remain continuous, or so that the inside spines are not white. Say goodbye to white inside spines! Imagine how different these projects would look without the PIPS...they wouldn't have nearly the same visual impact. Most of our packaging has double-layer thickness at the panels. To allow the packages to stay closed, the industry standard is to make the spines one-ply thick. That's what we do, and it's a great solution, but it leaves the spines unprinted. With PIPS, we will print on the reverse side of the stock at the spine or inside the pockets, so when constructed the spines will be beautiful! PIPS can be be set up by your graphics specialist if it is included in your project specification. Printing Inside the Pocket - SURPRISE! Our packages are two-ply thick at the panels, but are only one-ply thick at the spines. This allows the spines to move (and so that the front cover of the package won’t always be open when set flat on a table). RIP or PIPS will print on the reverse side of the stock at the spine or inside the pockets, so when constructed the spines will be beautiful! PIPS will be set up by your graphics specialist if it is included in your project specification. Reverse print is not hard to set up for most projects. You simply tell us that you need it and usually we can set it up using your main art. If you need something unique for the reverse print, send it or tell us the color if it's just a flood you're adding. Leo needed some elements to span two panels, while the Leo on the pencil loop needed to only appear there, and not be repeated on the spine. Note how on the PIPS art, below, there's a narrow strip of ink around the outer edges, as well as between the spines. We do that edge printing with PIPS so that when you view the inner panels on the final assembled piece (which are usually cut slightly smaller than the outer panel), any thin reveal of the reverse side of the stock will match the main art. 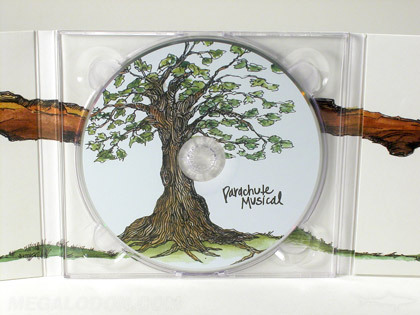 PIPS comes with all digipaks, either Tall 7-inch DVD Sized Digipaks or CD Sized 5-inch Digipaks. You can also request it for any of our other packaging styles, at a very reasonable cost.